Dr. Alley has become a popular fixture in many of my videos, and is a great, down to earth presenter of climate science, see below for more from him. I remember seeing this crock appear a couple of months ago. I also seem to remember that there’s a big problem with the wattsup graphs- the “present” on the graphs is geological present (BP- “before present”) which is actually 1950, and the ice doesn’t actually capture temperatures for some time before that because gas is still able to diffuse through compacting snow. There was also an error in the way “instrumental temperatures” had been added, I think. I saw a very good post somewhere describing the errors with a corrected graph showing modern temperatures correctly added to the ice core record. Doing my nut in now trying to find it. This seems to be very much the same thing- modern temperatures in Greenland added to the GISP2 record. Very different to the wattsup graph (0.04) in the video. I’ll get back with that link if I can. right, I didn’t even get into that wrinkle, because it was just too much, but will be covering it probably in a future vid. There are several prominent deniers that misuse this graph in the same way. Let me know if you turn anything up. I couldn’t find the link (hard to play whack-a-mole and remember which moles popped up where and when), but I think it might have been debunking somebody else misusing the same graph- wattsup at least seems to have noticed that GISP2 doesn’t show any of the modern warming. Even so, as you rightly mention in the video, wattsup is an anti-science site, and I don’t trust the red “instrumental temperatures” they have put on the graphs. There are a few scientific issues that occur to me that I doubt they have considered. The ice cores are only a proxy for temperatures, not a point measurement. How locally do they capture past temperatures? 100m? 1km? 100km? 1000km? What instrumental reading should they be compared to? Temperature at the drill site? An average over Greenland? Then there’s the fact that (from my limited reading) the Greenland environment is subject to local temperature variation which may be larger than global influences- I read that Greenland is in a cool phase at the moment and actually a degree or so less warm than would be expected considering global warming. 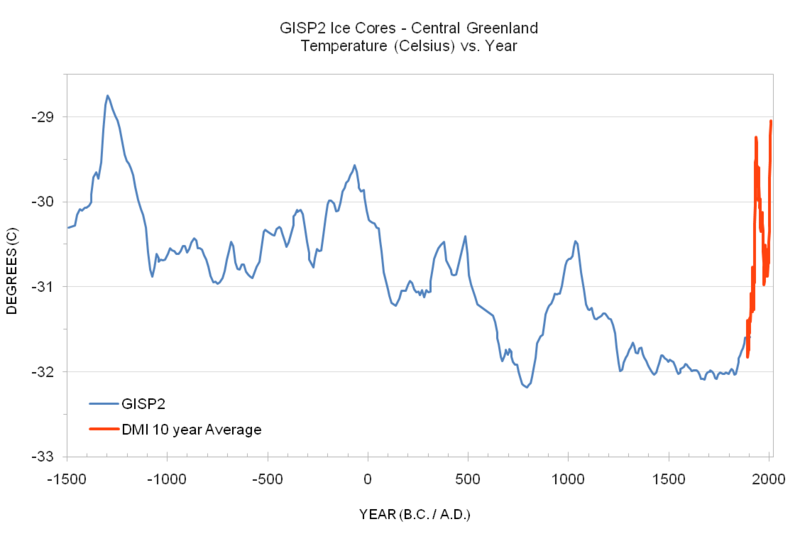 Of course, whether Greenland is as warm now as in the medieval, Roman or Minoan periods is not really the point. The point is that it’s still warming and is not going to stop. As Richard Alley explains in your film, the question is, is it going to warm slowly and steadily or rapidly? Thanks again for the excellent series of videos. check the video description for link to the longer Penn State interview, in which he talks about occasional changes in the North Atlantic that can cause more extensive ice cover, and considerable temperature drops in the winter. and thanks for the encouragement, plenty more coming. Found the link! Phew! That was doing my nut in. It was Easterbrook’s (rubbish) graph which I’d seen before, and to which the criticisms in my first post apply. Taking account of the calibration mismatch between GISP2 and instrumental records, it seems that the wattsup graph has modern temperatures just about right- just short of Roman temperatures, although I still wonder if GISP2 (a regional proxy) should be compared to a local temperature. Be good to get the opinion of somebody who actually works on this.